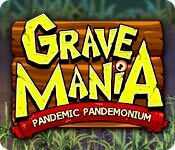 Grave Mania: Pandemic Pandemonium is rated 4.3 out of 5 by 39. Rated 5 out of 5 by zarafa101 from twisted little game This is a funny, twisted little game. LUV it! Rated 5 out of 5 by PerfectDark808 from What an awesome game!!!!! What can I say?! This game is a 100% improvement to the first Grave Mania game. I'm a TM freak and this game is awesome. Once you start earning those butlers one at a time it's a BIG help. There is so much to do in this one with all of the mini games you get to play. I've restarted the game 3 times and I get better and better everytime. You can rank goal, expert, and perfect scores. I just start back on the 1st level once I get all of the butlers and upgrades and get those perfect scores. Thank you Big Fish for this one. Rated 5 out of 5 by squigglyhopper from Really great fun! Better than the previous game (which I never thought was possible), the creators had obviously put some thought into the sequel instead of putting out the same game twice, which happens a lot with sequels. Immensely fun, hilarious story line, and I love that you have to play levels over again to get a perfect score. Hours of replay value. Bought this game without even trying the free trial - I knew I would love in and I did! Rated 5 out of 5 by Kitty221 from Grave Mania 2 Pandemic Pandemonium I loved the first, feel the same about this one. Addicting gameplay, fun storyline and excellent challenge. I do miss these type of Time Management games, too few of them anymore, I would love to see TM have a great comeback. I do hope there will be a 3rd Grave Mania in the near future. Two thumbs up!!! Rated 5 out of 5 by ivillagegrinch from The Zombies have returned! I loved the first Grave Mania, and I'm enjoying this one. It's harder to get an expert score, and instead of bopping a rogue zombie over the head to turn him into a butler, you have to find the parts. Otherwise, the humor is still there and still off-the-wall. Great game! Rated 5 out of 5 by BlackCat16 from Loved It! I am a TM game hound, and I absolutely loved this game! 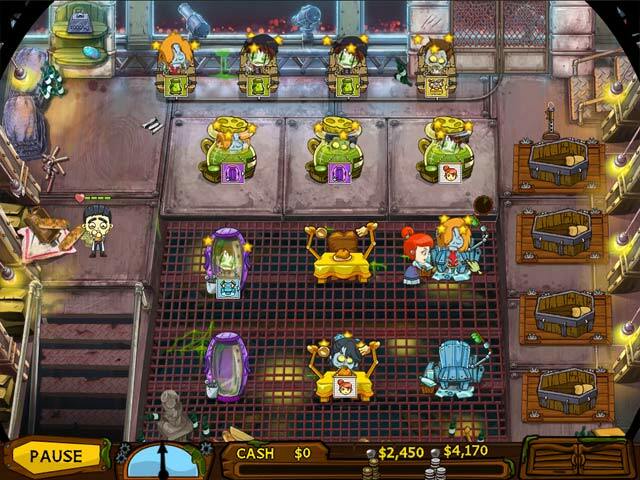 The story takes place in the middle of a zombie outbreak, and the goal is to prepare and bury as many zombies as possible. In this version, our main characters are traveling Europe while an outbreak is occurring, so everywhere they go they are engaged with zombie smashing fun. This game is similar to the “dash” type games, but with far more character. This game offers a lot play throughout, from the increasingly challenging levels, to finding butler parts to the mini games. In between levels you can upgrade equipment provided you have earned enough points. There is a lot here to keep the TM gamer entertained and challenged. This is a solid TM game that is loads of fun to play as well as look at. The developers clearly had a lot of fun when they dreamt up this one! Rated 5 out of 5 by jackfaithsmom from Loved the first, love the sequel! I really loved the first version of this game. The 2nd is super cute and actually more challenging than the first. This is a definite buy for me and for TM fans. Rated 5 out of 5 by tinam23 from So much fun! I totally forgot about this game (the original) & was so excited to see they made a sequel. I love the idea that you not only have to rush around to tend to the zombies- but that there are little mini games within some of the spa services. I chose to play on the "loca" setting, which was pretty challenging...I finished the game and I am currently trying to get an expert score on all the levels. My only complaint is it did not take me long to finish the game...if there is trilogy- please make it longer! Rated 5 out of 5 by mammamia21099 from Better than the Original! Awesome TM Game! I was so excited to see a break from the daily dark HO games we've been getting lately. This was a terrific game from start to finish. 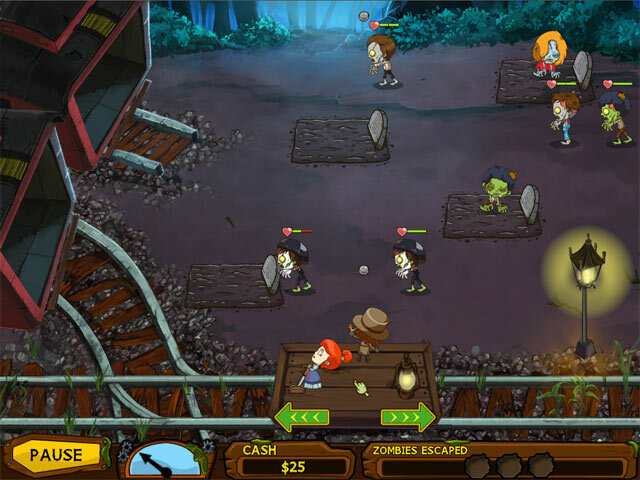 This game continues the adventures of taming the zombies. Our Hero's are back and as funny as ever. They take us on a trip across Europe to find the source of the Zombie outbreak. There are a lot more mini games in this one, which makes for a super game. TM gamers will totally enjoy this episode. Best yet, they leave off with a cliff hanger so we can look forward to #3 in the series! 5 stars all the way. Can't wait for more zombie fun! Rated 5 out of 5 by timbermoon from Even better than the first! I loved the first Grave Mania game, and this one is, surprisingly, even better. I like the micro games better, and I think finding the butler parts is entertaining. The music is great, as before. The cartoony graphics are completely suitable for the subject matter and play style, and I really appreciate the fact that the game doesn't take itself too seriously. (Yes, they use finger puppets.) I know there are those who would say they find the subject matter gruesome, but I would describe this game as light-hearted, silly, and just plain fun. Rated 5 out of 5 by auntjanell from LOVE THIS!!!!!!!!!!!!!!!!!!!!!!!!!!!!! Okay, loved the first one that came out. Love this one as well. Just a fun, cute game to play. Entertaining, the puppet shows are quirky and cute to watch. Rated 5 out of 5 by tailswhiskers from Another great Grave Mania game This is a little different, but the same. The graphics are great and so is the sound. There are different locations. Instead of paying for a buttler, you have to find the parts to make him. I would recommend this game. Rated 4 out of 5 by roosterjoy from Quite an improvement bought this a long time ago, then i saw that they have an iphone version. Good game. Funny, challenging, and an improvement compared to the first game! Rated 4 out of 5 by cheeky_monkey_ from Some improvemens over the first game There are some changes from the first game. The ones I like the most is the ability to know if you have completed a perfect game and you no longer have to have combos to get a higher score. The one change I do not like are the new mini games. While they were rather annoying in the first game, the new ones are worse, specifically the flower and food games which are silhouettes. I wish they would develop the game to be like Operation Mania, where after a certain point in the game, you can choose to complete the mini games or not. It gets annoying to be interrupted by a mini game when you are in your groove cuing up tasks. Rated 4 out of 5 by jennypockets from Grave misfortune I really enjoy these themed time management games. The hand drawn quality of this game is appealing and although the music didn't seem quite right, the sound effects are excellent. I only had one real problem with this game, like several of this type...having completed the game in less than a day it was far too short. I don't like the mini games, but that's just my personal preference, I prefer games to run smoothly, without distractions in the middle of a level. Overall though, it is fun to play. Rated 4 out of 5 by Altmoabit from Hate Zombies I hate, hate, absolutely hate Zombies but....with the lack of TMG I had to buy this because I love TMG. I would not compare this to any Dash games because the subject is dark andis no restaurant theme at all. It reminds me more of the Sally's game if anything. 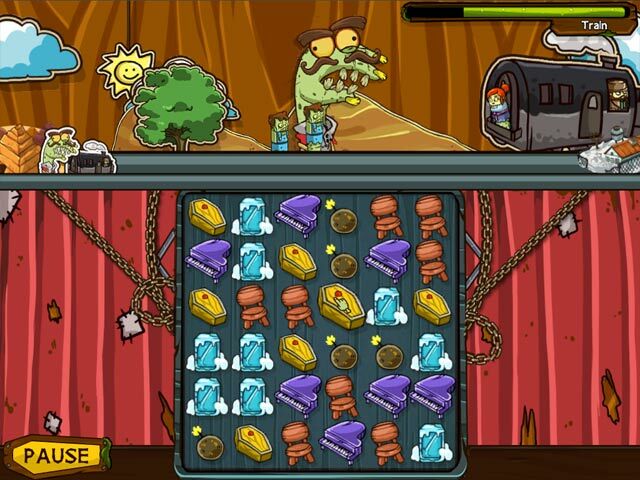 The undead come in and you put them in different places to wash, aligne bones, clean teeth etc before you put them in a coffin.The minigames are very strongly like in Sallys games because you have to match shapes or connect pipes etc. At the end of the bigger level, you can shoot them or dash them and bury them again. Not my cup of tea but I am desperate for TMG. They use cartoon figures in playmobile fashion and maybe that is why it could appeal to children.Music is pleasant and upgrades are pretty fast to get. But I still HATE Zombies. Rated 3 out of 5 by chapels from The CONSTANT mini-game pop-ups ruin the game The CONSTANT mini-game pop-ups, like every 3 seconds, really ruin the game. Rated 3 out of 5 by misformichelle from Great game but a lot the same. I LOVED the first version of this game. I was waiting anxiously for a 2nd one to come out so when this came out I almost bought it before trying...I'm glad I tried first because I'm still not sure if I will buy. As before the story line is amusing. The graphics are fun. The play is very typical time management with a zombie meets beauty parlor theme. easy enough mini games to get through the stations. You can upgrade fairly early on. The load times ARE faster which is fantastic! Though it seems a lot more fast clicking required than the 1st one. So I'm divided on this game. It's definitely worth a try. And if you dont' have the first? This is definitely worth the purchase! As is the first is very replayable and it might be worth it for me to just play that again and then see if I want a sequel enough to buy. Great game if I'd never played the first one. Good game having played the first. Rated 3 out of 5 by darlinbarb from Might Be Good for a Child Sorry. This one did not do it for me. Very colorful cartoon pictures, but movements are too slow. Rated 2 out of 5 by mrskrk from not my favorite i had high hopes with this game but it fell short. was just slightly boring. probably good for 12 and under. Rated 2 out of 5 by CleanN_Funny from Couldn't stand the interruptions (e.g. "aligning bones", "cleaning zombies' faces") At first I really liked the game but the more the trial went along the more annoyed I became by the forced tasks that break your continuity. The picking stuff off the faces was really the last straw, causing me to terminate the trial after 20 or so minutes and delete the game from my computer. It's a shame because it's a really cute premise and i actually loved it (thought i would buy) for the first 10 minutes or so. Rated 2 out of 5 by carlsb from Annoying side games What were those annoying little "side games" that pop up on almost all of the zombies in each station? The ones where you have to "clean their teeth" or "set their broken bones" or "choose a meal" I had enough of those and was SOOOOO glad the free trial ended, that was not fun at all, it was just frustrating because it made me forget where I was in the regular game. I would NOT buy this game!!! Rated 2 out of 5 by alsteele28 from Wrong time of the year - wrong game category First let me point out that this is not a match 3 game but a 'dash' game (along the 'dinner dash' vein), also whilst it is a quirky game and had a strong storyline, because I thought it was going to be a 'match-3' I couldn't really get into it, I did like the 'dash' games but I have 'outgrown' them and don't particularly like this genre any more. It had little mini-puzzles to complete at the different 'stations' and a bigger mini-puzzle game at the end of each level. So later on there may have been a 'match-3' element to the game, and one of the 'pack-shots' did show a 'match 3' screen shot (another reason why I downloaded it), but to actually categorise it as a match-3 was wrong. Had been categorised correctly, I would not have downloaded it, as it was I did download it and it was ok for about 15 minutes but I certainly would not buy it. Also I think it would probably have done better overall had been released nearer Halloween. Rated 1 out of 5 by LoveGameFish from Grave Maina Pandemic Juvenile and difficult to use.